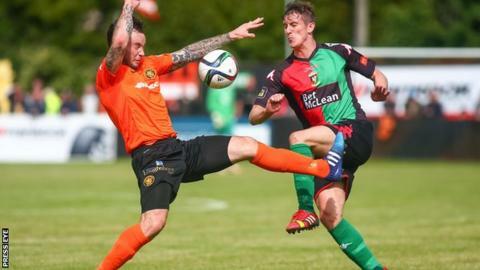 A sweetly struck half-volley by Marcus Kane from 30 yards in the 76th minute salvaged a point for Glentoran against Carrick Rangers at Taylor's Avenue. Ben Roy gave the top flight newcomers the lead in the 64th minute when his shot from the edge of the box was deflected off Calum Birney after Kyle Cherry's corner was not cleared. Carrick lie seventh in the league table with four points from three games. The Glens are ninth on two points, without a win so far in the campaign. The visitors dominated the first half and missed several good chances to break the deadlock, with home goalkeeper Brian Neeson excelling. Neeson produced an excellent save to tip over David Scullion's looping header early on and the home stopper also denied Conor McMenamin. Allen picked up the ball but his goalbound effort hit his strike partner McMenamin on the line. Just before the interval, Scullion was through on goal but he fired well over from eight yards out when he should have done better. Gary Haveron's outfit were much improved in the second half and after Roy opened the scoring, they almost doubled their lead when Browne hit the bar with a header from six yards out. Kane's outstanding right-foot effort brought the teams level and in the dying minutes, Allen escaped with a booking after charging at Joe McNeill off the ball.